Simple, or statement, Jhumkis or Chandbalis, nothing else frames your face like a lovely pair of silver earrings. At Ahilya we ensure that we only work with pure 925 Sterling Silver silver and create beautiful designer silver jewellery with unusual designs. All Ahilya pieces are made with Sterling Silver that may be gold plated and embellished with precious stones like diamonds, pearls, onyx, turquoise, lapis lazuli, tourmaline, mother of pearl etc. We love the aesthetic behind oxidized pieces, and you’ll find that in a lot of our traditional designs. Each piece is individually Hallmarked with a BIS-Hallmarking certificate guaranteeing 92.5 % silver. Ahilya designs draw inspiration from the rich Indian Jewellery heritage.We have everything right from the classics, to ethnic styles to more contemporary pieces. Our designs span across various collections and absolutely unique and can be paired with anything for any and every occasion. The Imperial Filigree Collection has beautiful and intricate cutwork earrings, while our Dakshin Collection has influences from South India , with Temple pieces reimagined in modern designs. Our Celestial Chandbali Collection is Mughal inspired. We also have the Hand painted Collection and Antique Coin collection. The Pearlescent Collection is an ode to all things mother of pearl, while our Glass collection and Enamel Collection consist of beautiful coloured glass jewellery and enamel (Meenakari) jewellery from Jaipur and Rajasthan. And lastly, our Zen Collection has beautiful, minimal pieces that are beautifully art deco and avant garde. We also have a Statement Collection that includes beautiful Designer pieces with tribal etchings, vintage designs, and contemporary structures. Stud Earrings: Our stud earrings come in a variety of sizes and options. Depending on the size and style, you can mix and match according to your sensibilities. Danglers and Drop Earrings: From minimal chalcedony drop earrings to vintage tribal danglers, sterling silver drop earrings have numerous options for different ages and style sensibilities. 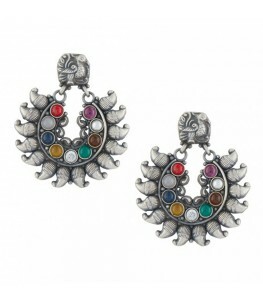 These also include the evergreen Chandelier earrings. 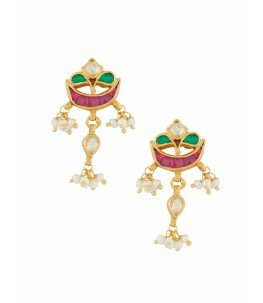 Jhumki Earrings: Ahilya has the largest collection of sterling silver jhumki earrings which ranges from glass earrings, to enamel earrings, to mother of pearl vine jhumkis, to beautiful engraved ones. 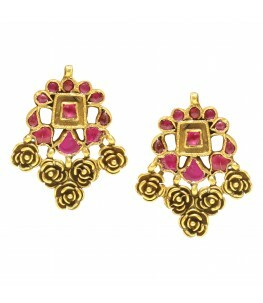 Our jhumkis look delightful and we love that they seamlessly work so well on all kinds of outfits and looks. Chandbali Earrings: Inspired by royalty, while these earrings are beautiful variations of crescent moon-shaped earrings with studded gemstones and pearls dangling on the bottom, the smaller versions of these earrings are referred to as Balis which are a lighter and simpler version of Chandbalis. An eclectic combination of heritage designs, dramatic patterns and contemporary styles, of the finest quality and at the fairest prices, each Ahilya piece is lovingly handcrafted taking days, or even weeks of labor. 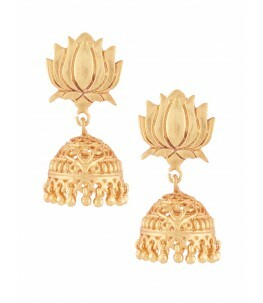 So choose from our diverse and stylish range of earrings, and own a beautiful heritage piece that lasts forever.